The Southern Sierra region of California is the fourth largest Integrated Regional Water Management (IRWM) region in the state, covering approximately 6,195 square miles. It includes many of California’s most precious natural resources: Sequoia and Kings National Parks, Sequoia and Sierra National Forests, and Devils Post Pile National Monument, and the upper watersheds of the San Joaquin, Kings, Kaweah, Tule, White and Kern Rivers, in addition to several smaller stream watersheds. 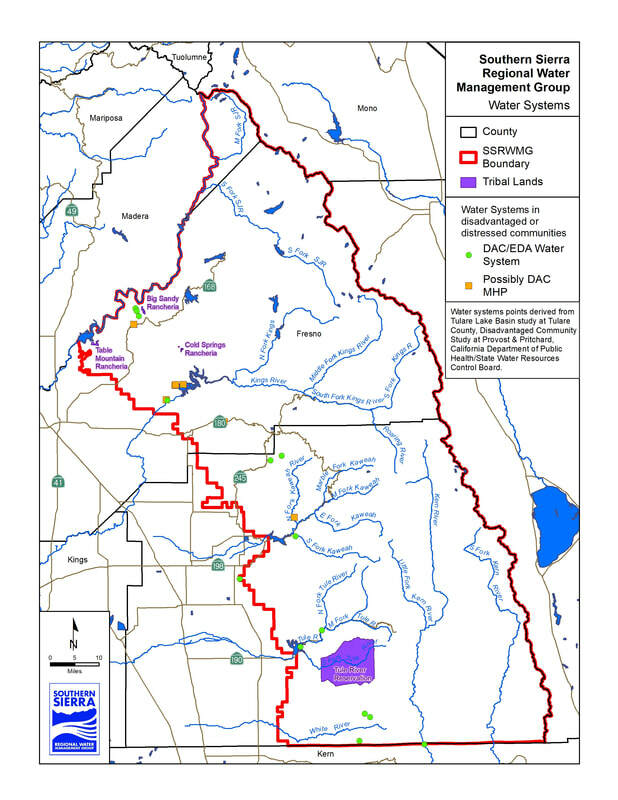 The Southern Sierra IRWM (SSIRWM) boundary contains the foothill and Sierra Nevada portions of Madera, Fresno, and Tulare counties; lands representing several Native American Tribes; and jurisdictional areas for several federal land agencies. Click image above to view more maps of the region's features and watersheds.